John Ruskin would have given today's tabloid press and paparazzi plenty of interest. After a sheltered and oppressive upbringing he married a younger cousin , Effie Gray and for six years they maintained a marriage that was in one vital sense a sham. For the marriage was never consummated. This sham remained the case until in 1854 they were joined in a Highland jaunt by the young, handsome and gifted painter Millais. Millais soon fell in love with Effie and she found escape from her marriage in a notorious court action in a suit for nullity. 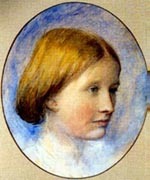 Subsequently biographers of Ruskin chronicle his repeated infatuation with very young girls, especially that of Rose La Touche. When they first met, Rose La Touche was a mere ten years old and Ruskin 40. Biographer Quentin Bell has this to say: "He lived on terms of sentimental intimacy with an entire girls' school and the modern readers knows not whether to blush or snigger at the romps and oglings, toyings and teasings which were conducted with perfect candour under the benevolent eye of the headmistress at Winnington." Rose was his "Rosie, pet and Rosie puss'' and he was her "St Crumpet" The strange under-currents were visible in 1859 when in his criticism of Millais' painting of Spring, Ruskin says it gives him the impression of "a field of penance for young ladies, where girl blossoms, who had been vainly gay, or treacherously amiable, were condemned to recline in reprobation, under red hot apple blossom and sip scalding milk out of a poisoned porringer." *Looking back from our 1990's viewpoint John Ruskin could be seen as a woolly minded thinker who needlessly rattled the cages of the Victorian Establishment. But the fascinating eclectic mind of Ruskin has much to offer and in the wonderful setting of his former home at Brantwood on the eastern shore of Coniston his painting and writings show their true worth. There were two major loves of his artistic life. The architecture of Venice and the painting of Turner. No doubt he would have remained an obscure but gifted rich man's son had he not felt compelled to spring to the defence of the painter Turner, who's works were being criticised by the art experts of his day. Ruskin knew, as we all do today, that the Fighting Temeraire and the other Turners, truly capture the spirit of the sea and landscapes. But who can say whether Turner would have had his true place in our culture had it not been for Ruskin. His passion for the art and architecture of Venice led to the Stones of Venice. A book that marks a stunning combination of drawings and prose. Ruskin was also a rich man described by some as a romantic socialist. He was akin to our own generation's Tony Benn in the way he picked holes in the belief in free market economics. In 1860 he spoke out against what he described as the Victorians belief that man was a "covetous machine" that was driven purely by self-interest. He told an audience of rich mill-owners that they were wrong to think that "the constant instinct of man was the desire to defraud his neighbour." He further irritated the Mill-owners by this speech. "Your ideal of human life then is, I think, that it should be passed in a pleasant undulating world, with iron and coal everywhere underneath it. On each pleasant bank of this world is to be a beautiful mansion. In this mansion are to live the favoured votaries of the Goddess (of "getting-on")" Meanwhile he adds "at the bottom of the bank is to be the mill; not less than a quarter of a mile long, with one steam engine at each end, and two in the middle, and a chimney 300 foot high. In this mill are to be in constant employment from eight hundred to a thousand workers, who never drink, never strike, always go to church on Sunday and always express themselves in respectful language." These free thinking sentiments led Ruskin to be admired by both Tolstoy in the cool of Russia and Gandhi as he started out of the road that led to Indian independence. Lear may be best known for his nonsense poetry, cartoon-like illustrations and being credited with inventing the limerick, but his ambition was to be an artist. In fact he was extremely accomplished, both as a painter of birds and as a landscape draughtsman. In 2009 the Wordsworth Trust at Grasmere ran an exhibtion telling of a trip Lear undertook in 1836 in the Lake District to draw landscapes after staying with his patron the Earl of Derby. They also detail where he stayed, who he met, his entertaining social encounters and his thoughts on his adventure. Charles Nugent, the curator of the exhibition, traced the route Lear took, covering long distances throughout the Lake District and, by Lears account, battling the weather. The exhibition contained over 100 drawings and watercolours including all the known pictures resulting from his trip to Ireland in August 1835 plus the letters, lithographs and books. During his journeys, Lear produced drawings relentlessly. On a good day, with fine weather, he might complete five or six sketches, sometimes with significant distances between the views. The images capture both the form and atmosphere of the landscapes and one can sense the energy of the young artist, eager to develop his skills. The journey through the Lake District, which lasted from early August until the end of October 1836, was undertaken on horseback and on foot. This would be a considerable achievement by any standards, but more remarkable because Lear was a grand mal epileptic. Lear kept his epilepsy a secret and hardly anyone knew about it until after his death. He once said, It is wonderful that these fits have never been discovered.